Haha, I actually started out with 16x16 tiles, but after I decided to go with single-screen rooms instead of scrolling, 8x8 felt like it would give me more breathing room. It really does offer more room, particularily if your game entities are smallish. Also am I missing something in the Forgotten Corridor? I seem to be stuck on a small platform surrounded with spikes and no way of escaping from the room. Assuming you have the double jump (and I don't think you can get down there without it... ), you can jump out to the right and then hook back left and land on the ledge above. You just have to jump at the last possible second. Liking the game, you've got a neat and coherent visual style and I'm impressed by the size of the game world. Other then that, maybe I didn't play far enough, but most of the mechanics seemed pretty straight forward. They are well executed and tightened up, which is in itself a pretty rare achievement. The jumping didn't feel particularly uncooperative and I dove right into the challenging level content straight away. Pretty solid project overall, congrats on finishing it! I sadly had an error with the graphics drivers, which kept me from booting it. Which is sad, because I'm really wanting to wreck this title. Thank you Pirate Hearts for examining about Japanese keyboard. But the key didn't work. Actually, the key you indicated is "Japanese input method on/off toggle button" I said before. I think pressing the key is absorbed by keyboard driver. Finally, I found a solution. I opened Device Manager and switched the keyboard driver from 'for Japanese keyboard' to 'for US keyboard'. It effected and the console was displayed with the key. And... I won the game!! Thank you for special and exciting gaming experience! Wow, I spent so much time playing this game, I even drew a map with pen and paper just before you put your map up, so definitely enjoyed it immensely. But, no matter what combination of keys I press, I cannot get the console to appear. At first I just wasn't sure it was supposed to be visible, but finally finding this forum I realise it's broken. I have the tilde key on my laptop keyboard underneath the escape key, and I also tried it with a USB keyboard, but no luck. And I'm on 99%, have scoured your map multiple times, have traversed the entire game multiple times and can't for the life of me see anything I've missed. It may be driving me a little bit crazy. Wait... losing takes all your upgrades away? Whaaaaat? I went and won the game, and then I went back to see what losing is like, and now all my upgrades are gone! Although I'm still at 96%, so I haven't lost everything. Turns out being hasty twice cancels out. How do you do the curved CRT effect? I assume you render to a texture and slap that texture on the surface of a curved plane? Just a quick note, I updated the game again today to make all controls bindable. It's not a perfect solution to the problem of grave/tilde not being supported in all layouts, and I'm a little wary it may introduce new bugs, but I can always roll it back if it doesn't work out. This is really well designed. I'm currently at about 20% and it's great. I like how it's not as simple as it first appears, but the complexity emerges slowly. As a guy who grew up with the NES and one of the few who actually preferred the second Zelda over the first one, that screenshot just sent waves of nostalgia surging through me. I don't know if it was made on purpose, but it looks just like the game's dungeons. I'm pretty sure I'm not being really original stating this, but your artwork looks absolutely amazing. I'm downloading the game right now, gonna try this out. Nice. Put me in mind of Jet Set Willy and all sorts of other good stuff from my dustiest memory banks. Thanks! Thanks! 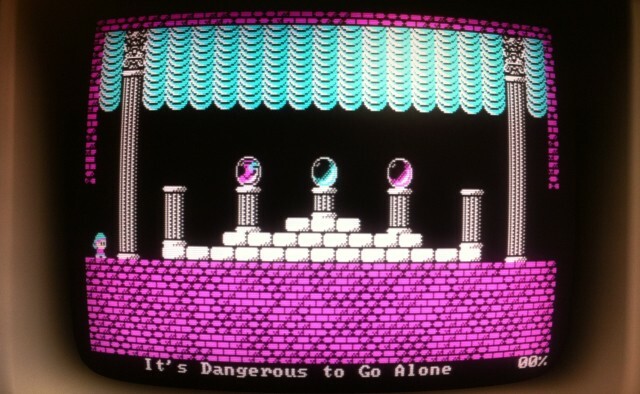 Zelda II is exactly what I was going for in the item rooms. In fact, the curtain tiles were originally pixel-perfect copies of Zelda II's at one point, but I eventually redrew them to avoid being quite so obvious. Hey, just tried the update and was able to set the tilde key up properly in Parallels. It was called Kanji in the key mapping menu so it must be the Japanese keyboard issue other people had. Maybe you could add Kanji as an additional key for console? The game looks really nice in non-CRT mode too, btw. Thanks for adding it! Thanks for the tip, I'll get that patched in tonight! This game looks stupendous! I love all the effort you put into getting the old CRT look. It definitely brings on some quality nostalgia. My first playthrough I failed miserably to Win the Game, but I definitely enjoyed it enough that I want to try again. Great job!